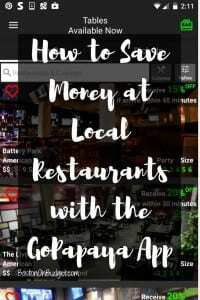 How to Save Money at Local Boston Restaurants with GoPapaya! Do you love eating out but hate to plan ahead and hate paying full price for a meal? 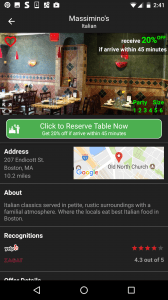 If you need help deciding where to eat out in Boston at the last minute while saving money on your total bill, you may want to check out the GoPapaya App. GoPapaya is a Boston-based app that connects Boston restaurants who are not at full capacity with app users who want to eat food fast. 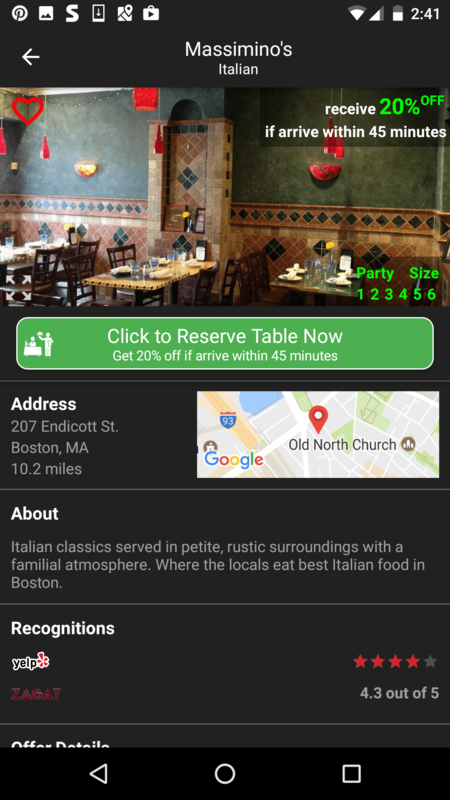 If you are looking to eat soon, open up the app and you’ll find restaurants who have last-minute availability as well as a offer available to entice you to dine with them. Discounts typically range from 10-30% off your food bill and you must arrive at the restaurant within 30-45 minutes to receive the offer (once you hit the reserve now button). There is also a new option for pick up if you’d rather not dine out and you can grab your food to-go and still get a discount! 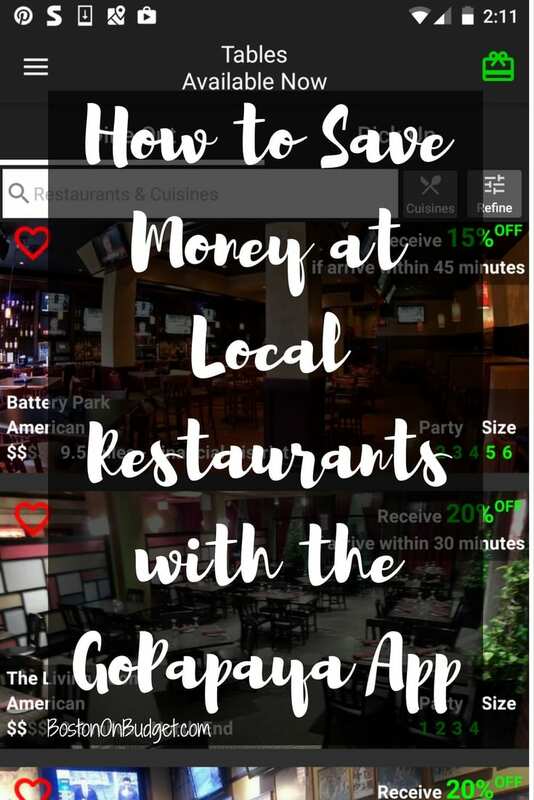 The app is great for individuals, couples or small parties and each restaurant listed on the app will say what the current discount is, the time you need to arrive, and the max number of guests for the discount. Most restaurants ask for a max party size between 4-6 people, and I haven’t seen availability/discount for a group larger than 6 through the app as of yet. 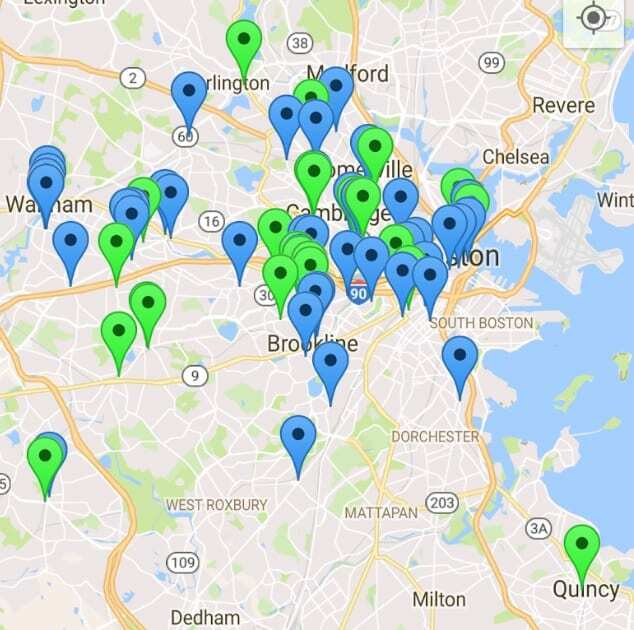 There’s a lot of participating GoPapaya restaurants in and around the Boston area as you can see from the map below. If you go to the map feature, you can see in real-time what restaurants are currently participating as they will be in green. Restaurants in blue use the GoPapaya app, however, do not have an offer at the moment. (This screenshot was taken on a Monday afternoon for a reference). There’s always been an offer (usually many) available during lunch and dinner when I’ve checked the app! The GoPapaya app is very easy to use and is available on both iOS and Android devices. If you download the app with my referral link you’ll receive a free $5 credit (referral code: KAT9663), and I will receive one too! As mentioned, this post does contain my referral link for GoPapaya and I will receive free credit if you download and use the app (thank you!) under my referral code: KAT9663. I did check out the app (as a regular person– no free meal or special treatment) recently and it worked great, especially for those who (like me) don’t like to plan ahead and like to receive discounts AND rewards! Here’s my experience and everything you need to know about the GoPapaya app. Let me know in the comments below if you have any questions or need any clarification before you use it! Simply download the GoPapaya app on your iPhone or Android device, and you will see in real-time what restaurants have open tables AND an offer. You may need to verify your e-mail before you are good to go! This came really quick for me. Once you have an account, you can check out all the deals as well as reserve a restaurant! Turn your Bluetooth on, and have the app open when you enter the restaurant (You’ll hear a little “ding” and the app will check you in on the app automatically). Tell the hostess you booked through GoPapaya and that’s it! Once you check in with the hostess and are seated, you don’t have to worry about the app anymore and your discount should be automatically applied to your bill. You don’t enter credit card information into the app nor do you pay with the app; just pay how you normally would for your bill. Technically you could be on a fancy date and your date wouldn’t even know you received the meal for a discount if they didn’t look at the bill. There’s no coupons, no vouchers, no showing the server the app, etc. It’s really easy and really discreet too! I will say that I personally had a little trouble being discreet with my first experience, however. We went to an ethnic restaurant and the discount didn’t go through automatically but my server (who also sat us) did not speak English well so I think that’s why I had a little problem. However, it was fixed no problem and I received 30% off my total bill. It wasn’t a big deal, but it did take an extra second. In addition to saving 10-30% off at local restaurants, GoPapaya also has a rewards system to take advantage of. There’s a few ways to earn points through GoPapaya’s rewards system and once you earn enough points you can redeem them for Amazon Gift cards or PayPal payments!! Once you earn 20 points, you can redeem those points for a $10 Amazon gift card or $10 in PayPal payment. Keep in mind I signed up for the app last week, opened the app a few days, ate at a restaurant with the app, and took the quick feedback survey that evening, and I had over 20 points in less than one week during the beta test. I cashed in those 20 points for a PayPal payment and received $10 in my PayPal account less than two days later. (It can take up to 3 days to receive payment, but mine came faster than that). It was really easy to request and I already saw the payment in my account. I don’t remember giving my PayPal address, so that’s why I recommend using the same e-mail when you sign up for the app, just in case. Overall I was really impressed with the GoPapaya app. It was really easy to use and really easy to find an array of deals. This is a great app for those who can’t decide what to eat but know they want to eat… Pronto. And get a great deal too. In addition to saving 10%, 20%, 30% or whatever it may be, you can also earn money by using the app! The rewards system is a great perk and was really easy to earn and redeem rewards! The Pick-Up option on the app officially launched yesterday so you can also save money if you don’t feel like dining out! I haven’t checked out the pick up option yet so make sure to read the offer details and follow the instructions carefully to make sure it works well for you! For more information about GoPapaya or to sign up, please head here. Have you used the GoPapaya app yet? What do you think of the app? What is your favorite Boston restaurant on the list? Don’t forget to use promo code KAT9663 to receive FREE credit when signing up for the app! *As mentioned, I will receive a referral credit (and you will too) if you sign up with my referral code. Please see my disclosure policy if you have any questions. Thanks!